Florida Election Results: DeSantis Defeats Gillum In Tight Governor's Race DeSantis, a Republican, edged out his Democratic opponent, Tallahassee Mayor Andrew Gillum, for the governorship. Meanwhile, Sen. Bill Nelson's re-election bid remains too close to call. 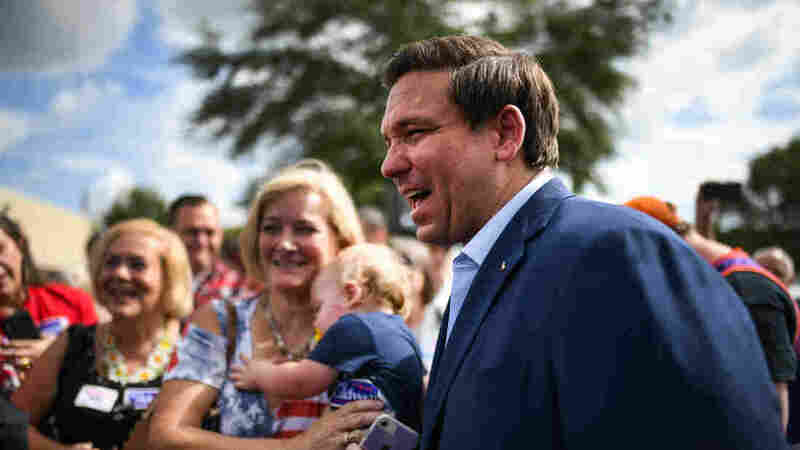 Ron DeSantis meets with supporters at a rally Monday in Orlando, Fla.
Ron DeSantis has won his race to become Florida's next governor, The Associated Press projects, derailing Tallahassee Mayor Andrew Gillum's bid to become Florida's first black governor. The former Republican congressman's victory ends a nail-biter of a race between the two men, who by late Tuesday night remained separated by just 1 percentage point. Gillum rode an unapologetically progressive platform to an upset victory in the Democratic primary earlier this year, shocking his better-funded opponents to emerge as a fitting foil to DeSantis. Endorsed by Vermont Sen. Bernie Sanders, Gillum mobilized his liberal base to face DeSantis, who made no bones about his close support for President Trump. DeSantis, for his part, won his own primary against his more moderate opponent by a surprisingly wide margin. Yet in this battle of progressive and conservative favorites, it was ultimately DeSantis who emerged with the general election win. He has promised to reduce the corporate income tax and has railed against "government takeover of health care." The state's other marquee race remains too close to call. Democratic Sen. Bill Nelson is deadlocked with term-limited Gov. Rick Scott in a battle of the state's political heavyweights. So far, neither one has delivered the decisive haymaker, and both men stand with 50 percent apiece in Tuesday's closing hours. However the election swings, its results will not play a pivotal role in the balance of power in the Senate, as some had expected at the start of the night. The GOP has retained control of the chamber after flipping Democratic seats in Indiana and North Dakota and beating back a furious challenge in Texas.